To a crowd in Las Vegas on Thursday, Obama pronounced “We are the Saudi Arabia of natural gas.” Is that supposed to be a good thing? Do the people Saudi Arabia seem happy now? 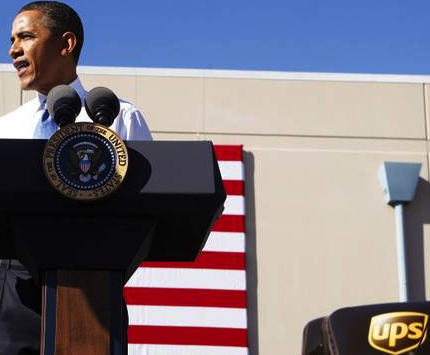 Even though Obama pays lip service to renewables, he gave the speech at a UPS facility. UPS has been the subject of government incentives to promote fleet conversion to natural gas. This in fact undercuts renewables by making fossil fuel use relatively cheaper at taxpayer expense — another subsidy for the dirty and dominant oil and gas industry. Then in a bit of sophistry that only Mitt Romney could admire, Obama says “The wealthy don’t need more tax breaks, you’re the ones who deserve a break.” He said those words while he in fact he gives taxpaying citizens the shaft and pushes more subsidies towards UPS and the fabulously wealthy fossil fuel industry. If you think Obama needs a tune up, tell him so directly, or look at our open letter to Obama for ideas. Find the media coverage of the event here. Obama: ‘We are the Saudi Arabia of natural gas’ – Thursday, Jan. 26, 2012 | 12:40 p.m. – Las Vegas Sun. This entry was posted in Action-Alerts, News. Bookmark the permalink.